Parallel Wireless and Artemis Networks both announce steps to bring innovative radio technology closer to market. Parallel markets multi-mode small cells – the Converged Wireless System (CWS) – that can operate in a mesh topology, co-ordinated by a controller node that Parallel calls the Hetnet Gateway (HNG). The announcement today states that CWS is now commercially available as a reference design built on the Intel Transcede T3150 dual-mode small cell SoC. 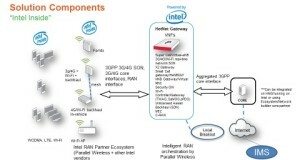 On top of that the company integrates Radisys’ Femtotality for the 3G element of the CWS. The HNG co-ordinates the access points over the X2 interface, and can provide a single “supercell” link back to the core network. The HNG can also act as a host of virtualised basebands on the same platform as its SON function, as well as a host for gateway VNFs, enabling it to act as a multi-vendor orchestrator. The HNG is able to combine orchestration, gateways as VNFs and C-RAN co-ordination and scheduling using OpenStak and DPDK on COTS based on Intel Xeon processors. Parallel’s vision is to enable much lower capex and opex of cellular radio networks by delivering radio networks that are built on standard hardware elements, under the control of orchestrators that themselves deliver network functions as virtualised instances. The big goal is to change the economics of network deployment and operation. Parallel’s announcement comes on the same day as Nokia announced it is going to assess Artemis Networks’ pCell technology. pCell is the small cell technology that Artemis claims gives users get better capacity the more radios are crammed together. That is because interference between radios serves to give users very small bubbles of capacity, effectively allowing multiple re-use of the same spectrum. As Artemis has not taken the lid of its box of tricks publicly, a thorough going over by a vendor like Nokia is likely to change perceptions of some in the industry – good results permitting, of course. Nokia said that it will be trialling the technology with a few selected customers, and also looking at the potential for new location-specific services. That would along the pCell with its Mobile Edge Computing vision.